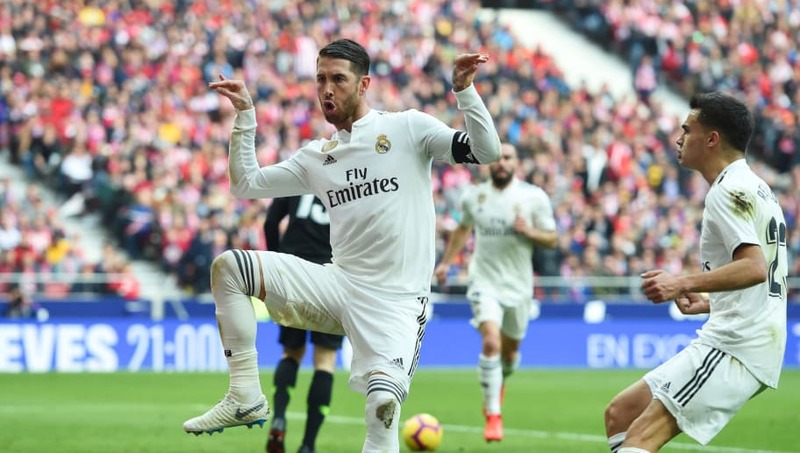 Real Madrid overcame local rivals Atletico Madrid in La Liga with a 1-3 victory in an action-packed derby at the Wanda Metropolitano on Saturday. Casemiro opened the scoring on the quarter of an hour mark, as Sergio Ramos rose highest to flick a Real Madrid corner into the path of the Brazilian, who was facing away from goal, but managed to hook the ball past Jan Oblak with an acrobatic effort to give the visitors the lead. Antoine Griezmann provided the response after breaking clear of the visitors' high backline before slotting the ball through the legs of Thibaut Courtois on the 25th minute to draw ​Atletico level. VAR was called upon to judge whether the Frenchman was offside, but the goal was given. The constant threat of Vinicius Junior paid off as the Brazilian drew a foul from Jose Maria Gimenez inside the Atletico box after another electric run down ​Madrid's left flank, before Sergio Ramos converted the resulting penalty to restore Los Blancos' lead just before half time. Former Los Blancos striker Alvaro Morata looked to have stunned the visitors as he latched onto a raking pass out of defence from Gimenez before lobbing the ball over the onrushing Courtois and into an empty net, only for the goal to be ruled out by VAR for offside. Substitute Gareth Bale had his trademark say on proceedings as the Welshman collected a a through ball from Luka Modric in the box before firing a low effort past Oblak and into the bottom corner. Thomas Partey was sent off for the home side after receiving a second yellow card late on for a reckless challenge as Los Blancos saw the victory through with a hard-fought display, claiming the derby spoils on enemy territory. One of the traditionally distinct marks of Diego Simeone's Atletico side has typically been the efficiency of his team in playing as a unit. Los Rojiblancos have generally defined the two banks of four system under the Argentine, with a clear team unity breeding results for Los Rojiblancos. However, that usual cohesion and military-style precision in moulding the team as a collective unit appears to have waned in recent times. Atletico's play does not reach the levels of fluidity in passing and movement as once existed with the now-departed Gabi and Tiago in midfield. Antoine Griezmann has now been directly involved in 120 LaLiga goals for Atlético Madrid. Too many passes went astray from Simeone's side in the middle third of the pitch on Sunday, as Thomas Partey and Saul Niguez struggled to find any rhythm in their passing to move their team forward. Instead, the home side often looked over-reliant on the quality of Antoine Griezmann on the counter-attack, with a less solid foundation behind the front line to build upon. STAR MAN - Antoine Griezmann offered Atletico a consistent out-ball and an attacking threat which in some respects compensated for his team's lack of telling quality in other areas of the pitch. Atletico were unable to play consistently as a team, but the potential to unlock Griezmann on the counter-attack provided star quality in attack nonetheless. WORST PLAYER - Santiago Arias was poor at right back for the home side. The Colombian's positioning was at fault consistently in the first half, with the full back often caught too high up the pitch, leaving his central defenders exposed to Real Madrid's threat in the wide areas. Arias was too often unavailable to receive the ball when required due to poor positioning, and his absence from the danger area resulted in his side conceding Madrid's penalty in the first half. Santiago Solari has developed a habit of making statements through bold team selections, with star names often left out in favour of greater work rate and application. Against Atletico, the likes of ​Gareth Bale, ​Marco Asensio and ​Marcelo were left on the bench, whilst ​Isco was not even in the matchday squad. The likes of Lucas Vazquez and youngsters such as Vinicius Junior and Sergio Reguilon were selected ahead of some of Madrid's more decorated names, with mixed results. Solari's selection gave him the increased work rate and commitment that is surely the intention, but Los Blancos often lose a degree of quality as a consequence. As has often been the case recently, Vinicius Junior's raw attacking talent provided Madrid's greatest threat going forward, though the visitors often lacked the star quality that the likes of Bale and Asensio could offer. STAR MAN - Vinicius Junior was a constant thorn in Atletico's side throughout, as the Brazilian's fearless attacking initiative down Madrid's left flank provided the visitors' most consistent threat on Sunday. The Brazilian showed tremendous pace, skill and desire to burst down the side of Atletico's defence at will and earned his side a penalty at a crucial stage of the first half through his fine offensive work. WORST PLAYER - With Madrid's outfield play considerably improved to a man on Saturday, Thibaut Courtois was the one Los Blancos player at fault at the Wanda Metropolitano as the goalkeeper left himself too vulnerable for Griezmann to slip the ball through his legs for Atletico's equaliser. The Belgian was fortunate that Morata was judged to be offside later in a similar incident. After suffering their second consecutive league defeat, Atletico travel to face Rayo Vallecano away in their next La Liga outing next Saturday, before returning to Champions League action with a huge clash against Serie A giants ​Juventus four days later. Meanwhile, Real Madrid will recommence the defence of their European crown as they face Ajax in the first leg of their Champions League round of 16 clash at the Johan Cruijff ArenA on Wednesday. Solari's side then host Girona in La Liga next Sunday.